We’re straying away from the usual wooden products to have a look at luxury garden bird baths. On the site we’ve looked at wooden bird tables and they always go well with a nice quality bird bath – although not a wooden one for obvious reasons! Here we will look at the best bird baths from traditional stone through to a more contemporary statement piece for the garden. This contemporary sand stone bird bath tops our charts for its stunning looks with its beautiful twisted sandstone. The bird bath looks fantastic in the dry and even better in the wet when the colours come even more alive. Made from solid stone this piece will be in your garden for years to come whether you choose to put it on a patio or in the garden itself. For us it looks its best when placed in a border surrounded by colourful plants and some nearby shrubs or tree to give the birds cover when they come for a drink. This is made from hand carved stone and is a real work of art to behold in your garden. It has an average hight of 77cm and weighs around 70 kg – These are all handmade so this can vary slightly but thats nice as it means each one is unique in exact specifications and colours. The item will come delivered on a pallet to your kerb side and takes around 2-3 weeks for delivery – These are a made to order product most of the time. If you’re looking for contemporary looks and a stylish look for your garden then this could be the luxury bird bath for you. If you’re looking for a more striking design, but still want the luxury of sand stone then there is a couple of other options. These are all still hand made from sand stone just by different designers. The square top and more twisted edges adds to the designer look and wet or dry this is a stunning piece of sand stone. You can really see the craftsmanship that has gone into this sandstone. You can check the latest prices and availability on this one on Amazon below. If your tastes are for more of a classic luxury bird bath then this straight lined bath may suit your garden. We this this is the best option for a cottage style garden or more traditional designed and styled garden. We think it has an air of a church font in its looks and placed correctly will attract a lot of birds. If you’re in the UK its handily available on Amazon – Click here for product details. When ordered it takes around 3 to 6 days for delivery. Its manufactured from sandstone from the Waddington fell quarry which is just outside Clitheroe in West Lancashire. Its advisable to place this bath on a stone base where ever you choose to put it as shown in the picture below – Its on a nice sandstone slab. 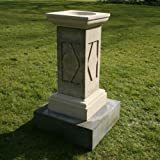 In terms of value for stone this is our top rated bird bath for the garden. It has a beautiful spiral design and is hand crafted from sand stone like our other luxury bird baths. Its slightly smaller than the other bird baths featured but at 60cm its still a good height. Again we’d recommend placing it on a stone base that has a solid base underneath as you would with a patio as at 70kg in weight you don’t want it not level and toppling over. Where will the bird bath go? Is it a suitable place to put a level stone base to sit it on. Look around the area for cover from shrubs and trees which will make the birds feel safer. What height of plants will be around it? So do you want it to nestle in amongst them or sit proudly above even in the summer months. Is there any cover? If its not in a sheltered spots its well worth covering it in a felt top (like plants) to stop it being damaged by a hard frost. It’s best to position it near a bird feeder too so they can get food and water at the same place. Makes sure you can get to it easily as the top may need cleaning out of leaves in the autumn and it will beed filling in the summer months.